ForgetMeNot is designed to be the BEST reminder and checklist app available. Some others might be fun to use, but they are light on features. This app has everything you need, and it helps you keep track of all your reminders and checklists, providing time based or location based alerts. ForgetMeNot manages all your reminders. Each reminder can be a single item or a checklist of items. You can optionally set a date/time for an alert to be raised. You can optionally set a location and be advised when leaving or arriving at that location. Combining date/time and location means you will be advised when leaving or arriving after the set date/time. You can optionally allocate each reminder to a category. 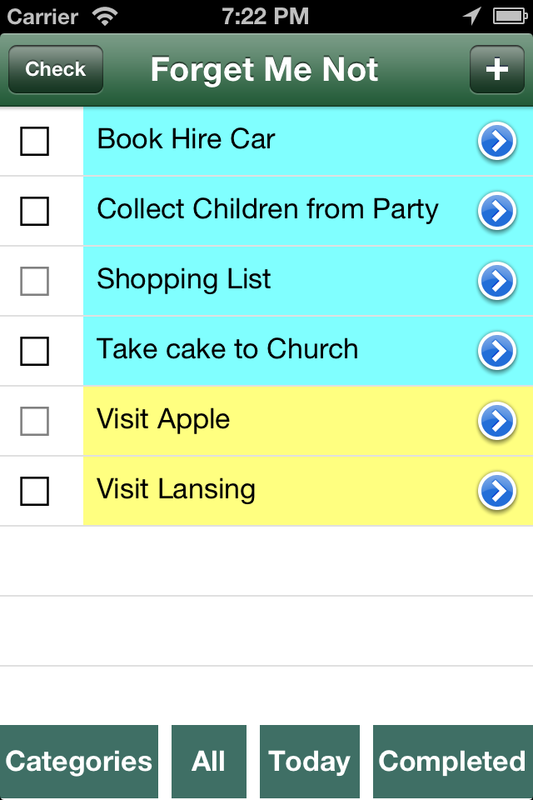 Categories can be colour coded to make it easier to work with your list of reminders. You can set a default alarm sound for each category. Sounds can be changed for each reminder. You can also specify “Link to Calendar” for each category. This means any reminders with date/time will also appear in your default calendar app. From there, you can follow the URL to get back to ForgetMeNot. Use the "Check" button when departing to see if there is anything outstanding at your current location. Make sure you select "Done" from the navigation bar at the top when updating data. Updates are usually only saved when you select "Done" to return to the list of reminders. You can delete items from lists by swiping to the left, and confirming. You cannot delete a category that is in use, i.e. where reminders have it selected as the category type. ForgetMeNot uses the "Significant Location Change" features of your phone. This means location is usually determined from mobile phone tower information. You will get best results by setting a small distance when leaving a location and a large distance when arriving at a location. ForgetMeNot uses the audio features of your phone to play sounds. The app may occasionally fail to play a sound, but will always vibrate when there is an alarm. Remember that sounds only play if the volume is up. Check Settings >Sounds and make sure Ringers and Alerts are up loud and Change with Buttons is OFF. If sounds are persistently not being played, you may need to turn the phone off and back on. To avoid clutter, it is best to delete reminders after you have finished with them. ForgetMeNot is optimised for the iPhone and only operates in portrait orientation.